25) Leyton4ever! | 26) xxxninaxxx | 27) iLOVEprisonbreak!!! Just comment to be added to the list, or PM the thread starter. 1. Because she's unique, literally. 2. Because she's everything we want in a child. 3. Because she's Edward's and Bella's. 4. Because she's the most beautiful baby in the world. 5. Because Edward has a special song for her, too. 12. Because everyone falls in love with her when they see her. 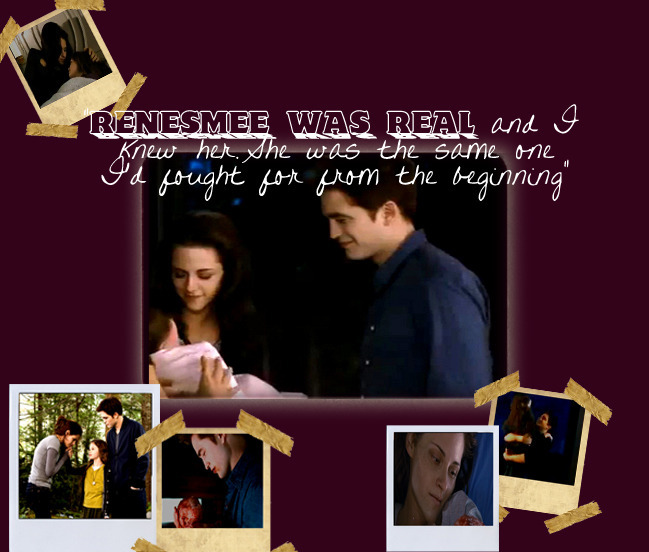 Renesmee did not cry, but she breathed in quick, startled pants. Her eyes were open, her expression so shocked it was almost funny. The little, perfectly round head was covered in a thick layer of matted, bloody curls. Her irises were a familiar - but astonishing - chocolate brown. Under the blood, her skin looked pale, a creamy ivory. All besides her cheeks, which flamed with color. Her tiny face was absolutely perfect that it stunned me. She was even more beautiful than her father. Unbelievable. Impossible. 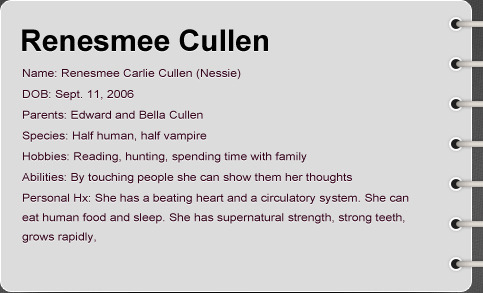 Renesmee was quite clear on the whole good vs. bad as it applied to hunting humans; she just thought that donated blood made a nice compromise. Human food filled her and it seemed compatible with her system, but she reacted to all varieties of solid food with the same martyred endurance I had once given cauliflower and lima beans. Animal blood was better than that, at least. She had a competitive nature, and the challenge of beating Jacob made her excited to hunt. Renesmee nestled into my neck, her hand against my cheek but no images in my head. She didn’t have pictures for her feelings now. “What if they don’t like me?” she whispered, and all our eyes flashed to her face. She sighed, and in my head flashed pictures of all of us in one quick burst. Vampire, human, werewolf. She fit nowhere. 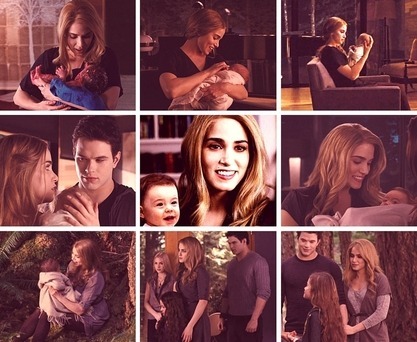 “I get to stay with you?” Nessie demanded. "I'm not dangerous at all. I never hurt Grandpa or Sue or Billy. I love humans. And wolf-people like my Jacob."